The resident DJ at Flamingo Casino every Thursday evening and on Radio Teemaneng Stereo 89.1 FM every Saturday afternoon, and every second Tuesday on OFM, The Sound Of Your Life, DJ Bizzy B needs little introduction for local house music fans. 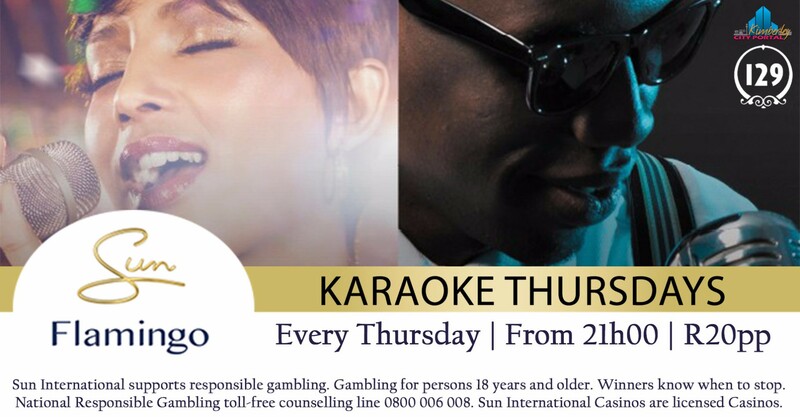 Every Thursday Night at Bar 129, grab the mic and get your sing on. Prizes to be won for the best performances. Tickets sold at the door for R20. No alcohol will be sold to persons under 18 years. Sun International supports responsible gambling. Winners know when to stop. National Tollfree Counselling Line 0800 006 008. Gambling & Promotions for over 18’s only.